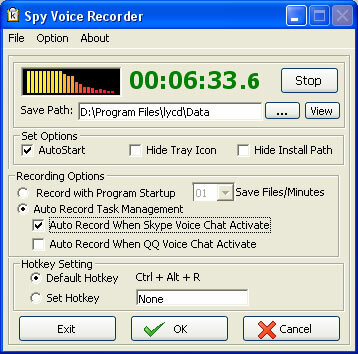 Spy Voice Recorder, really computer sound monitor expert, an easy sound monitor and voice recorder designated mainly to record and spy Voice Chat of instant messengers in real time, such as MSN Voice Chat, Skype Voice Chat, ICQ Voice Chat, MySpace Voice Chat, QQ Voice Chat, also including other sound from sound card. With its stealth spy mode, Spy Voice Recorder can play a great role in monitoring online voice chat of child or cheating spouse. Record and spy Voice Chat of instant messengers or chat room in real time. ...... Spy Voice Recorder is monitoring software also can record the sound from peripheral equipment, such as the sound from CD player, TV, radio, telephone, cell phone, etc. * Spy Voice Recorder aims to spy and monitor voice chat of instant messengers mainly. (MSN Voice Chat, ICQ Voice Chat, Skype Voice Chat, QQ Voice Chat, MySpace Voice Chat ,etc.) Available with your sound card, both sides of voice chat can be recorded clearly. * Spy Voice Recorder record and replay a wider range of sound from microphone, line-in, line-out, streaming audio from Internet and music played from the computer, even the sound from peripheral equipment. * Spy Voice Recorder support auto recording task trigger options. You can select to auto record when Skype/QQ activate. Qweas is providing links to Spy Voice Recorder 3.24 as a courtesy, and makes no representations regarding Spy Voice Recorder or any other applications or any information related thereto. Any questions, complaints or claims regarding this application Spy Voice Recorder 3.24 must be directed to the appropriate software vendor. You may click the publisher link of Spy Voice Recorder on the top of this page to get more details about the vendor.